Dealing with infertility issues can put a strain on your relationship. It’s not easy navigating the emotional ups and downs while trying to conceive. Layer that with financial stress, hormone injections, doctors’ appointments, news of friends and family getting pregnant and you’ve got a recipe for relationship disaster. An infertility diagnosis can make or break you as a couple. In my decade of experience helping thousands of couples conceive their miracles babies, I’ve learned the most effective strategies couples used that helped them not only survive their fertility journey, but made them stronger as a couple. 1) Accept your partner can’t understand all of your feelings. While it may be helpful for your partner to maintain a positive laid-back attitude, it can leave you feeling alone in your worries and infuriated by his passive approach. After all you’re probably doing everything under the sun to make your baby dreams a reality: getting acupuncture, drinking fertility smoothies, quitting alcohol and caffeine, undergoing invasive procedures and researching endlessly. How can he be flippant about something so important? While it may feel like he doesn’t care, that’s probably not the case. Of the thousands of women I’ve supported over my 10 years as a fertility specialist, I can’t tell you how many times I’ve heard women say the same thing about their men. Rest assured your man isn’t that different than the others. Do they all not care? No. They just have a different way of dealing with things. Plus they can’t help feeling a certain amount of detachment from the situation. After all they’re not going through month after month of periods. The two week wait is nothing to them and they’re not dealing with the hormone fluctuations. They just don’t get it. While I completely understand your frustration, you’ll probably find more peace of mind by simply accepting his limitations. You may even consider appreciating his low-stress approach. It won’t help if he’s freaking out every month too. Trust me. I’ve seen that scenario and the pressure was almost too much for the woman to handle. Look for the others ways he supports you and focus on that. The less upset you are, the better for your fertility. And in the meantime you can seek out other sources of support from women who understand exactly what you’re going through, like from my free fertility Facebook support group, Heidi’s Support Circle. You can join here. 2) Set milestones together as a couple. Most women find it reassuring to have a plan in place rather than indefinitely trying month after month with no backup strategy. It’s tough being in limbo and can leave you feeling powerless. Setting milestones together as a couple gets you on the same page so you can approach your fertility journey as a team. Schedule a time to sit down together and devise a plan, one step at a time. Prepare for the meeting with your suggestions and evaluate what to do next as a couple. For example, a plan might be to agree to try to conceive naturally for six more months while incorporating regular acupuncture treatments, dietary and lifestyle changes and supplements. If you’re still not pregnant by then, you’ll meet with a fertility specialist to consider medical intervention. 3) Share your thoughts, feelings and suggestions in digestible amounts. Your partner will be more receptive to meeting your needs if you tackle just one or two things at a time. Sure, you’re feeling overwhelmed by everything so I understand the urge to unload all of your concerns onto your partner at once. But if your goal is to get their support, it’s important to consider how the information will land on them. Don’t worry. You’re not alone. Again, introduce one thing at a time. Whip up a fertility smoothie and see how he likes it. Take the focus off of trying to conceive and highlight the other benefits of health and lifestyle changes, like: increased energy, better moods, lower blood pressure and improved sleep. 4) Find ways your partner can support you that play to his/her strengths. Your partner may not be the best at empathizing with your feelings, but that doesn’t mean he doesn’t want to be supportive. Consider your partner’s strengths and what you love about him. Maybe he’s great with financial planning and can devise a budget for expensive fertility treatments so that you don’t have to worry about it. Maybe he knows how to make you laugh when you’re down or motivate you to exercise by going on hikes together. He could drive you to all of your appointments and make sure your list of questions is answered by the doctors. I had one patient who couldn’t stand making bone broth (a fertility-enhancing food for both men and women that I recommend drinking on a daily basis) so she asked her husband to make it for them. He loved making it and she felt great about drinking it together as they both noticed the positive effects it had on their health. This journey isn’t easy for him either even though he may not show it. He probably hates seeing you suffer while feeling helpless to do anything. If your partner knows the ways he can be supportive, he’ll probably jump at the chance. Your partner may feel like he’s failing you as a man by not getting you pregnant, especially if he’s been diagnosed with Male Factor Infertility. Or he may not be able to perform when you’re ovulating because of his anxiety. Maybe he feels helpless about knowing how to support you and keeps letting you down. He could be worried that your relationship will never be the same as he misses how things were before the stress of trying to conceive took over. In other words, your partner probably could use some loving reassurance too. And the magical thing about being generous with kindness and love is that it usually gets returned to you tenfold. Instead of getting upset with your partner for not meeting your needs, consider thinking of how you can meet his first. You might just be surprised at what he offers in return once his defenses are down and his heart is open. Nobody’s perfect and the infertility journey is not for the faint of heart. Be compassionate to yourself and your partner along the way trusting that you’ll weather the ups and downs together. I’ve seen many couples come out stronger on the other end of this journey. I know you will, too. P.S. 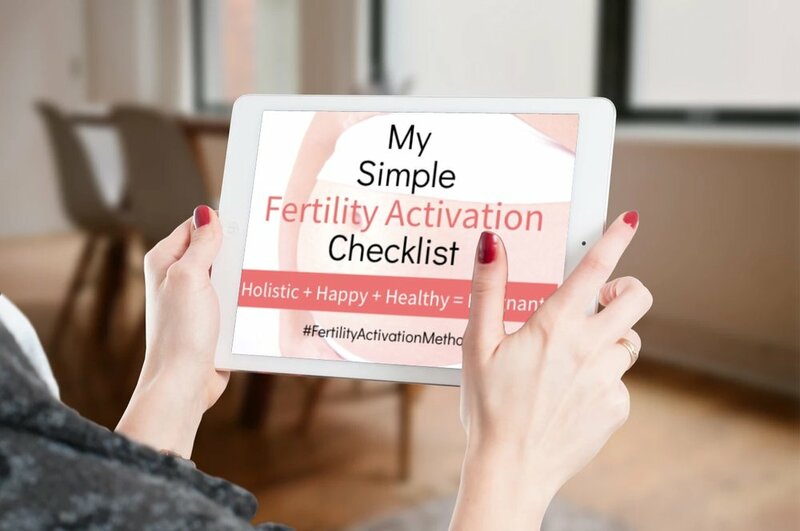 Grab my FREE Simple Fertility Activation Checklist - Wanna know the simple steps you can take that many women overlook that keep them from getting pregnant? Make sure you're on the right track! > Grab my checklist here.